US President Donald Trump arrived in Hamburg for the G20 leaders meeting no friend of globalisation and multilateralism. Most of the analysis so far has focused on Trump himself and the uncertain future of the US-led international economic order. Yet the summit should also bring into sharper focus the importance of the kind of multilateral cooperation and leadership that mechanisms like the G20 offer. Paradoxically, and with some foresight by other G20 leaders, the presence of Trump in the White House could end up helping make the G20 relevant again. The G20 has been struggling with relevancy for some years now. Almost a decade ago, it played a pivotal role in developing a coordinated response to the global financial crisis and avoiding a descent into beggar-thy-neighbor policies. It has had a few other wins, including spearheading some reforms to the International Monetary Fund, but has generally been struggling with its 'peacetime' role. Now, however, with no single country willing or able to lead the global economic order, the G20’s raison d'être has again become clear. At its most basic level, America's ability to lead the international economic order stemmed from its status as the world’s largest economy which, until recently, it was by a wide margin. It has been the world’s single indispensable economy. Cooperative policy actions by the US can thus crowd-in cooperation by other countries. The US has also, again until recently, invested heavily in this role through its willingness to shoulder the burden of leadership. This, of course, is the part that is changing under President Trump. As the US increasingly vacates its role in leading the international economic order, it is clear that no other single country is capable of filling its shoes. China and Germany have been cited as potential contenders. But neither is really up to it. China is not ready, and probably not as interested as it portrays. Germany’s economy, despite its strength, is too small on its own to corral others’ cooperation. The EU has significant economic weight but, as a a group of nation states subject to their own domestic politics, it cannot make up for the absence of US leadership. This is where the G20 comes in. The G20 has existed since 1999 but came into prominence in 2008 when it was clear that the G7 no longer carried sufficient economic clout to lead the international coordination of economic policy. 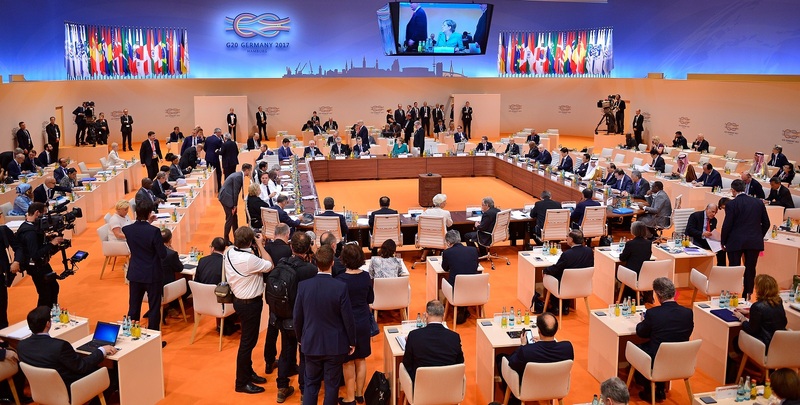 The G20 stepped in, able to present itself as a kind of goldilocks grouping – large enough to carry economic clout, small enough to be effective, and diverse enough to be at least somewhat representative of both developing and advanced economies (certainly far more so than the G7). For all the summit’s shortcomings, the benefits of the G20 were on display in Hamburg. Or perhaps more accurately, the benefits of the G19 (that is, all except the US). The communique, and comments from Germany’s Chancellor Angela Merkel, appear to make clear that the rest of the G20 maintained a common approach committed to the G20’s pre-Trump agenda. Most importantly, they committed to continue with the Paris Agreement on climate change, calling it 'irreversible', and clearly noted the US as the sole exception to this position. The communique also largely kept the group’s stated commitment to open trade, the World Trade Organization, and the rules-based trading system; even if it contained compromises on wording to placate the US, and according to Merkel herself, was 'very difficult' to negotiate. That suggests that here too there was a good amount of unanimity amongst the rest of the group. Importantly, the communique also indicated that the G20’s role would continue on one of its other core mandates – to cooperate on promoting international financial stability through the work of the Financial Stability Board and the strengthening of the International Monetary Fund as the world’s financial safety net. Thus the G19 have effectively acted as a counterweight to the stated agenda of protectionism and bilateralism being pursued by President Trump. We can question how effective this will ultimately be. But it has at least provided a forum for the rest of the world’s largest economies to tell the US, in a coordinated fashion, where they stand on the key global public goods in which they themselves, and many others, have a stake. Right now, that would appear to be the kind of leadership we need.